There's no one more appropriate as a cheerleader when there are gardening chores to be done than our Gardening Lawn Gnome. Cheerful and upbeat, he's got his tools and watering can and is ready to help you. He's wearing old-fashioned overalls and boots and looks like someone who can be trusted to care for your rose bushes. At the very least, he'll encourage you as you do your weeding and pruning. We have many varieties of garden gnomes. If you're looking for a cool "gnome with lantern," see our Hiking Solar Gnome Statue – it even lights up at night! If "ballerina garden gnomes" strike your fancy, well we don't have those, yet, but we do have the Mexican Dancer Gnome. 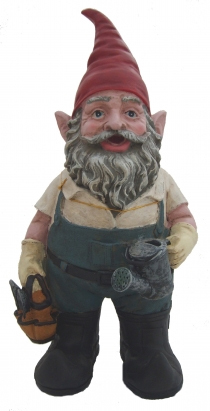 Bring all sorts of fun to your outdoors with our festive and whimsical lawn gnomes and other whimsical garden decor.